A preschooler’s best talent is their imagination. They have lots of it! Too much sometimes. This is the time when princess dreams and superhero imitations start showing up. Your average 4 year old needs their imagination nurturing with pretend play. Model cars and trains are best introduced at this stage, when they stop banging toy cars on the floor. Educational toys should be included in their toy box, toys that range from dollhouses and kitchen toys to spelling boards. Toys are among the best ways to teach numbers and the alphabet to their playful minds. Orchard is a game that's quite easy to play. Your preschooler will find it enjoyable without realizing that they are learning in the process. It teaches your child strategy and techniques on how to beat the raven, and it can be used to teach colors, counting, matching, and other preschool skills as well. The game rules are simple for young kids to comprehend. One of the best things about this game is that everyone wins. You don't aim to beat other players; instead, it is a cooperative game, perfect for little four-year-olds, who struggle with their emotions more than most ages do when they don't end up as the winner. This is a wonderful age for learning the essence of working together as a team to achieve the same goal - in this case, beating The Raven. The board pictures a cute little orchard with charming fruits. The pieces are nice and durable, except for the fruit basket--which is not really essential for the game--but it may be helpful to find a special place to keep all the little pieces. Dominoes are not just played by matching numbers or pictures on tiles. Pieces can be used for creating structures, houses, and a lot more. This set has 240 dominoes altogether, designed specifically for setting up a domino race. The animal themes, bell tower, and wooden blocks will add beauty to the structures your child has created. It's great for imaginative play. Each piece is made of beech hardwood, and the set is packaged in a simple cardboard box. 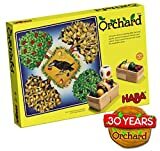 You may find it helpful to store the pieces in a designated basket or bucket, to keep them together and available for many possible games during their long years of life. This is a fun and educational game for preschool age on up, and parents will love to play with it too. Kids love to play with their imagination. If they want to be a princess or a superhero, they'll really act like one. Nurture your child's imagination and creative games with this Haba Blossom Sky Room tent. It's perfect for a child's play room, or even for a bedroom. What child wouldn't enjoy having a little room as a play house? The fabric is durable easy-clean, cooling cotton polyester, sturdily constructed in every detail, from the garland vines and velcro attachments down to the well-sewn seams. It includes a comfortable floor mat for sitting or napping on and has three pockets in the interior, which can hold books and toys or serve as their house "cabinets." The tent can even be hung from a ceiling with the correct hardware (purchased separately). This tent will make us all wish we could be kids again! Compared with the usual blocks on the market, this wooden toy provides an unparalleled building experience. It enables your child to form a historical Roman Coliseum and at the same time provides the freedom to create other architectural works. This set is not just for young children; even older adults love to collect and play with these items. Some pieces may be small for children younger than three years old, so be observant when giving this toy to a child with younger siblings. The set is composed of 117 blocks which are made of high quality beechwood. 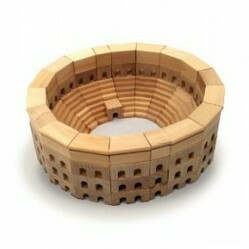 Some children will want to form the Coliseum and leave it set up for display; some may prefer to build, then tear down so they can set up any structure they like. Parents who want this to be memorable to their kids could glue the pieces together and display the structure on a shelf as Junior's "first engineering project." You never know ... when they're older, they may be building the real thing!